Here is vogue living in one of the best streets in Raumati. This home offers advanced styling and flair, daring to be different. 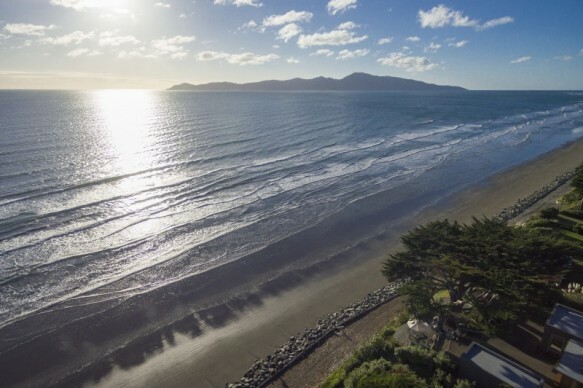 Apartment style lock up and leave option with outstanding sea and Kapiti views, but setback for shelter. The property sits on an easy, thoughtfully landscaped interesting small section with seamless indoor/outdoor flow providing lots of options for entertaining. The entrance level has an independent guest or family room with a gas fire on a granite hearth, which flows out to the sun room. Upstairs is the private suite with ensuite and incredible views from every window - ideal for an Airbnb or as luxury accommodation for guests. The ground floor has a stunning granite kitchen, Australian hardwood floor, family room and master bedroom with dressing room and ensuite. A second double bedroom and family bathroom are also on this level. There is various access to the outside sheltered sunny decks which capture all day sun and views, or enjoy the sauna. The gardens and deck areas have been designed for ease with a mix of planter boxes, Macracarpa sleepers and various entertainment areas. Step through the gate to your own shared beach access, which has been newly engineered and rebuilt. A single garage with laundry and car pad completes the picture. This home would suit a professional couple or solo or empty nesters. Very flexible settlement terms available. Selling by Deadline Sale (unless sold prior) closing 15th May 2019.